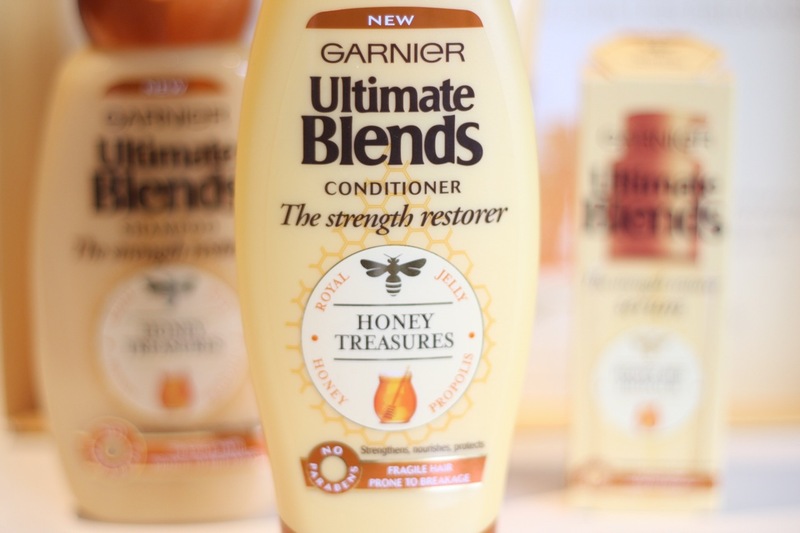 One thing I love is honey, so there was no way I’d say no to Garnier’s new addition to the Ultimate Blends range, the Honey Treasures Strength Restorer, with honey, propolis and royal jelly. Using the honey properties, it helps strengthen hair – according to trials (using shampoo, conditioner and serum on bleached hair, resistant to brushing), it had 84% less breakage and hair 6 times stronger. 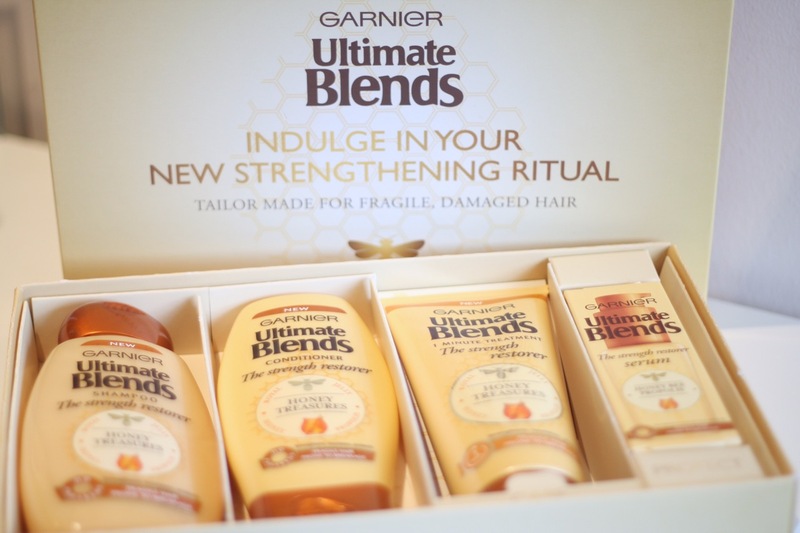 Last year I got an exclusive preview of Ultimate Blends and got a tailored care pack. I loved the products, as they are great and super affordable. 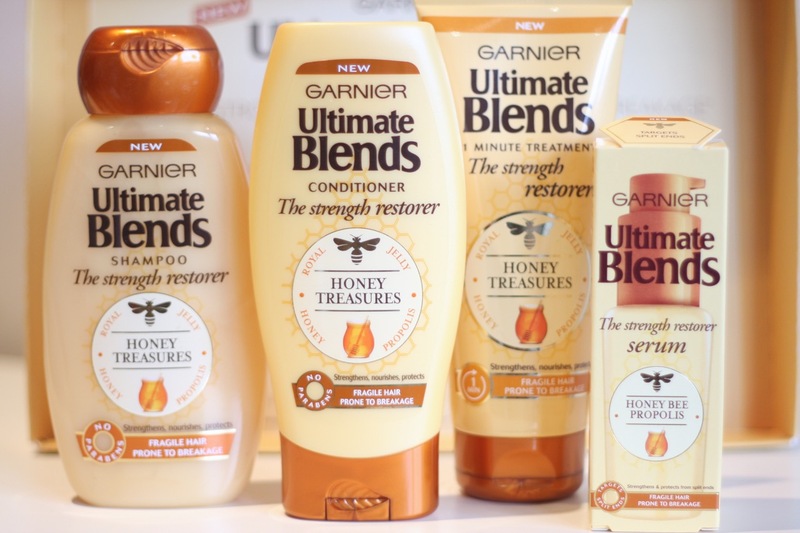 This year, Garnier expanded the family and added four lovely honey based products. Before I talk about each one, I have to say how amazing the smell is on these products. I mean, it is honey and I love it. After use, the delicate scent just lingers on, and I can even catch a faint whiff of it the following day. Love it. 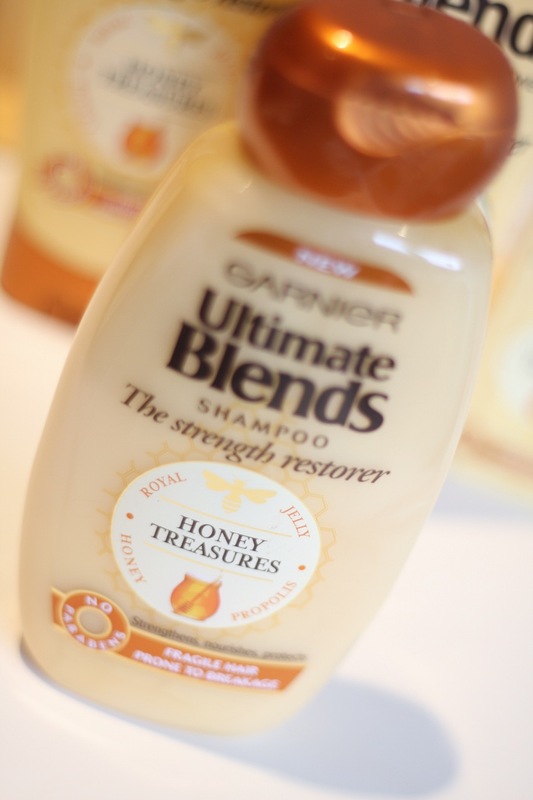 The Honey Treasures Strength Restorer Shampoo is lovely. Pearlescent light yellow, it creates a lovely lather and leaves hair clean but soft after rinsing. The Honey Treasures Strength Restorer Conditioner is light yellow, thick and creamy. It makes hair feel soft on application and after rinsing. For that extra care, they also have the Honey Treasures Strength Restorer 1 minute treatment mask. Light yellow and quite thick, it might seem that it is not working,a s hair doesn’t feel particularly soft upon application, but it is after rinsing. I like that it really gives it a boost and it is only 1 minute, so can be used even in the busiest days. Also, I think they improved the formula on the 1 minute treatment; it seems nicer that the previous ones. 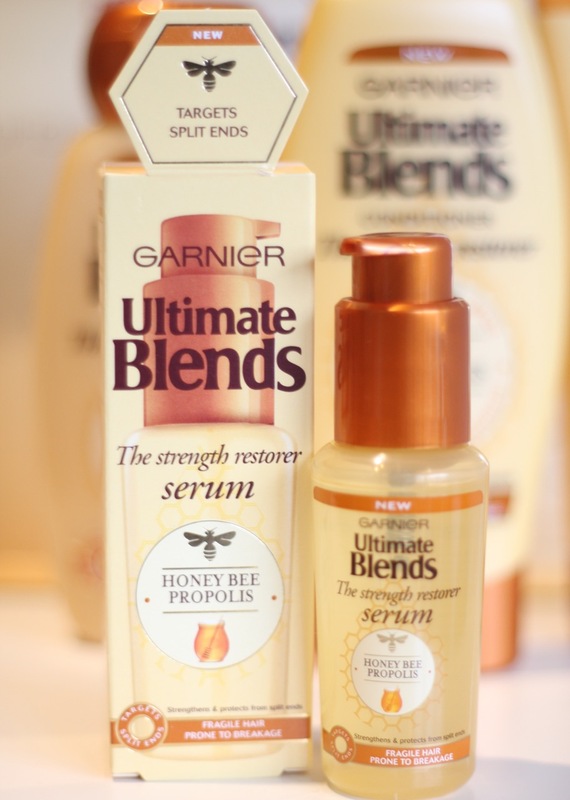 Probably my favourite, the Honey Treasures Strength Restorer Serum is divine. A light, colourless serum that helps conceal split ends and restore shine, without weighting hair down. It relies heavily on propolis (I love propolis) which is said to act as a protective barrier. Hair feels smooth and shiny. Using them all made my hair feel very soft and tame – not to mention smelling divine. 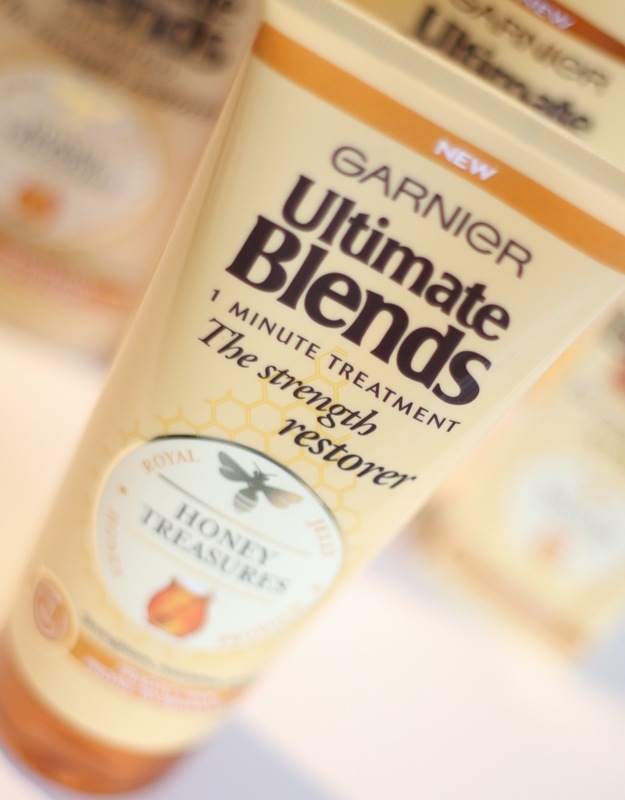 The Ultimate Blends Honey Treasures Strength Restorer line is available from major retailers countrywide. The serum costs around £5 (which I think its great value for money), shampoo and conditioner under £3 each and the 1-minute mask is under £5. As I said, fantastic value for money. 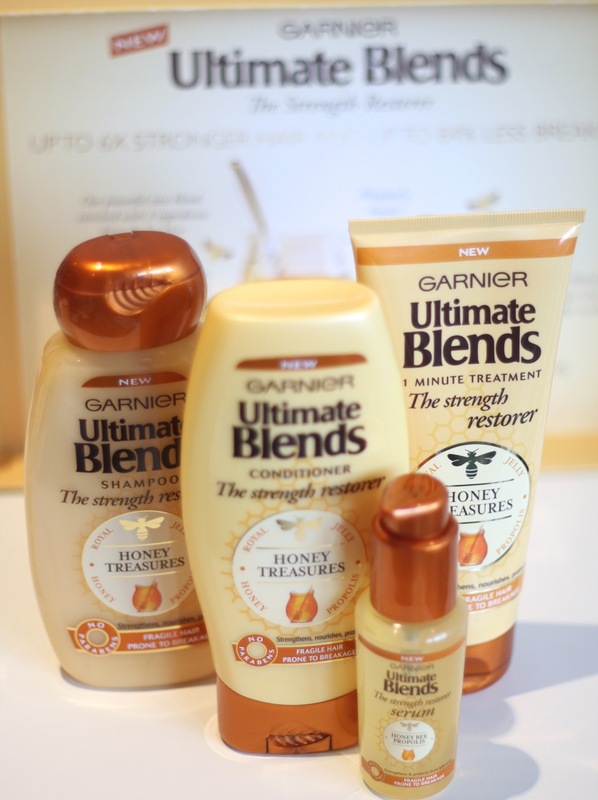 Find out more about the Garnier Ultimate Blends family. I had no idea this came out! I can’t wait to try it now! It is lovely…. the smell on my hair after using is to die for. Love! Thanks for you visit and comment. Indeed – for me, the smell alone is a winner, but hair does feel lovely after use! I know right? Just so amazing. Love the smell too much, and the products are very good too. Well worth it, especially with the great price.